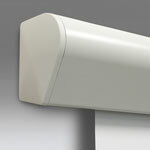 VCB Silhouette E :: Draper, Inc.
A sleek, curved aluminum case finished in white, the electric VCB Silhouette E features a contemporary design for professional videoconferencing presentations. 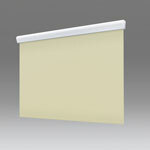 This free-hanging surface maintains flatness thanks to the weight of the screen and bottom dowel. The background and dowel retract completely inside the case to provide a clean appearance with no exposed fasteners or mounting brackets. Case dimensions are 6" high x 4-3/4" deep (15.2 cm x 12.1 cm). Sleek, curved, aluminum case with endcaps white standard, black optional. Diagonal size: 70" x 70"
Image/Viewable area: 70" x 70"
Overall size: 70" x 70"